Cleansing is the place to begin to create healthy, glowing skin. Regular cleansing will keep your skin clearer and more readily able to take in the benefits of your other skin care products. 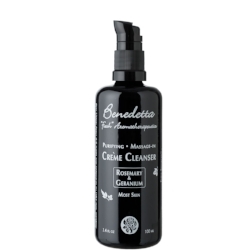 A good cleanser should clean your skin deeply and thoroughly, while keeping your skin hydrated and pH balanced. A good cleanser will never leave your skin feeling tight and dry. Be sure to cleanse each evening before bed. (If you are wearing make-up, cleanse twice.) Cleanse again in the AM if needed.